CSJM Scrutiny Form 2019: The Kanpur University has recently announced the CSJM UG and PG Exam Result 2019 on the official site. Some of the applicants are happy with their marks and some are not satisfied with their marks obtained by them. So the authorization provided a golden chance for those applicants who are not satisfied with their marks in the way of Scrutiny form. Their marks are recounted, but not recheck their answer sheet. Applicants, who are not satisfied with their score in any of the subject, can apply for the CSJM Revaluation Form. The Scrutiny form will be available in the online mode on the official site of Kanpur University. The entire candidate who given the exam of the CSJM are informed that the university released the annual examination result in the month of May 2019. Candidates are required to fill the application form, who is not satisfied with their result. The application form will be available on the official site of CSJM. On the opening of the homepage find the link of the Kanpur University Scrutiny Form 2019. Click on it. Pay the application fees through debit card or net banking etc. Take print out of the application form for the future use. The pattern follows by the university for all of the courses is divided in the odd and even semester. The odd semester exam is conducted in the month of December and even semester exam is conducted in the month of June. The CSJM Scrutiny Result 2019 is declared on its official website within few days from the date of result declaration. 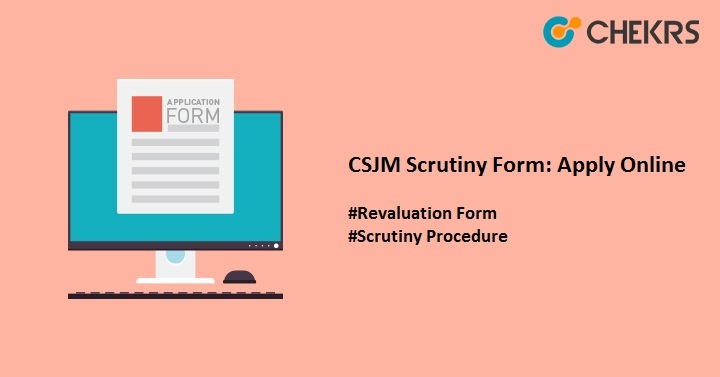 Candidates who given the exam of the CSJM Scrutiny is required to check the result. Through that, they come to know that they fail or not so we provided here the steps regarding the CSJM Scrutiny Result checking. Candidates require to go on the official site of the CSJM i.e. kanpuruniversity.org and click on the section of the “result“ tab. A new tab open in which applicant required to search their relevant course and semester once they find it, click on the link to the view result. The results appear on the screen. Candidate can download the result for the future use.